Hey, this week’s New Yorker has a cover drawn by comic book genius Chris Ware. Check it out! Monday morning, this is what we saw. I think this is the earliest I’ve ever seen snow on the ground. 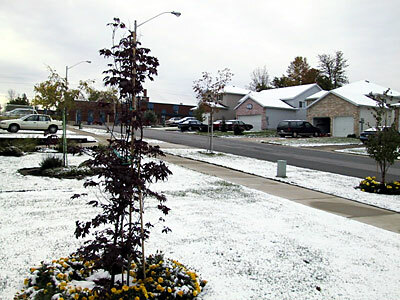 Mind you, Collingwood is in the heart of ski country in Ontario, and they get more snow than most places. Still, snow in October?